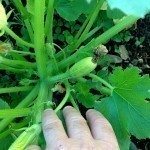 I have a few spaghetti squash questions. 1) I bought seed for spaghetti squash that had a picture of the mature squash on the package; however, my spaghetti squash never seemed to turn yellow. Instead, they are all a very light, light green. Is there something wrong with them? What can I do to change the color? 2) Is spaghetti squash considered a summer or a winter squash? 3) When is the correct time to harvest them? 1) They may not be ripe yet. Give them a little more time on the vine and they should turn yellow. 2) It is a winter squash.